Editor's note: If you'd like an email notice whenever we publish Ross Ramsey's column, click here. This story has been corrected. Donald Trump’s version of Project Runway — the rolling interviews of potential underlings for the new administration — has included a handful of Texas officials making the catwalk through the lobby of Trump Tower. He wants (maybe) some of our current and former officials, but not necessarily the conservative ideas that have been driving Texas government for the past couple decades. Case in point: Most of the candidates are federal and not state officials. U.S. Sen. Ted Cruz and Reps. Jeb Hensarling of Dallas and Michael McCaul of Austin are modeling for jobs, or were. Speculation had Cruz on the attorney general list. When that gig went to U.S. Sen. Jeff Sessions of Alabama, some started talking the Texan up as a possible associate justice for the U.S. Supreme Court. McCaul, chairman of the House Committee on Homeland Security, is being mentioned as a potential secretary of that department in the executive branch. Hensarling, who chairs the financial services committee, is on some lists of candidates for Treasury secretary. Two from state government — former Gov. 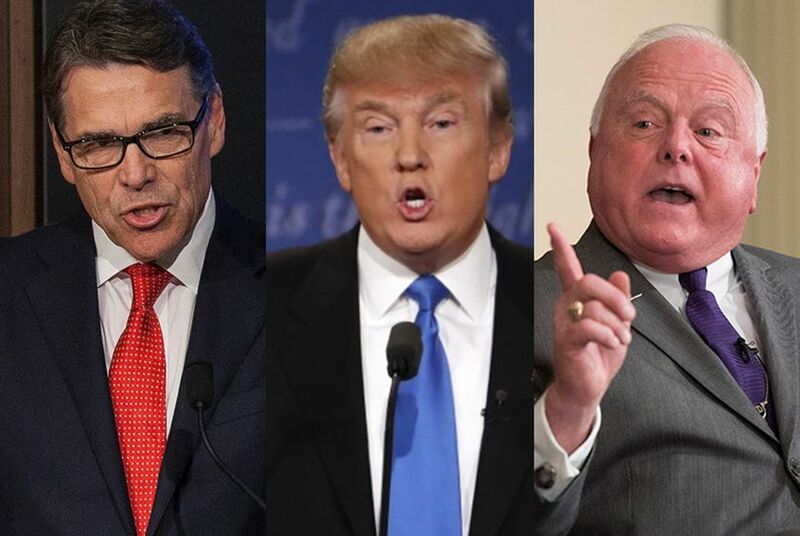 Rick Perry and current Agriculture Commissioner Sid Miller — have been mentioned, too. Perry went through the Trump Tower turnstile this week, and he’s been mentioned for so many jobs — most recently head of the Defense or Energy departments, and before that, Veterans Affairs and Commerce — that he might have a hard time winning any of them. Miller is a Trump stalwart whose political, social media and officeholder exploits have made him a risky choice for the Cabinet. Trump would have to decide whether it’s worthwhile to run a Technicolor Texan like Yosemite Sid through Senate hearings while the country is still forming its first impressions of the incoming administration. Chances are, there will be a Texan or two in the White House somewhere. There always are a few. But the federalist ideas that power Texas politics haven’t exactly surged to the top. Of the Texans still on Trump's maybe list, only Perry is a straight-ahead representative of a particular kind of government and a particular set of policies. Miller was a backbencher in the Texas House, and Hensarling, McCaul and Cruz are still in their first and only elected positions — all in the federal government and none in the executive branch. Perry, the longest-serving governor in the state’s history, exemplified a largely Trump-friendly approach to government — conservative, assertive, business-oriented, tax-sensitive — at a time when the state economy was, for the most part, booming. He got an early ticket on the Tea Party express, blasting the mean ol’ federal government and hailing the states as the “laboratories of democracy.” He made two presidential runs out of what his camp called the Texas Miracle. Trump seems less interested in the products of those laboratories — or at least the one called Texas — and more interested in some of the personalities voters have elected there. The state is the cornerstone of the GOP’s electoral maps, and any top official from any political party has to salute when Texas goes by. Texans are critical to the financial side of politics, and at least one such donor, Dallas investor Ray Washburne, has been on the Trump Tower post-election guest list. Chances are, there will be a Texan or two in the White House somewhere. There always are a few. But the federalist ideas that power Texas politics haven’t exactly surged to the top. Trump has talked about a few of them — a balanced federal budget, term limits for federal officials, doling out block grants for big federal programs instead of formula funding with detailed requirements. Maybe it’s not realistic to expect the federal government, even with a Republican at the top, to cede power to Texas and the other 49 states, as the Republican officials at the top of state government have clamored for it to do. Texas has sued the Obama administration dozens of times, trying to gain more control over the levers of power, and conservatives here would love to have a White House that sees things as they do. Perhaps those Texas-style ideas about government will come later, after the jobs in the still-forming federal executive department are filled. One of those Texans might get a job — and sneak in with an idea or two.